MLB Handicapping: Early Winners and Losers from the A.L. One week of the 26-week grind that is the Major League baseball regular season is in the books. And amidst the home openers, blown saves, exciting plays, beautiful weather and monster home runs there has been plenty of information for the discerning baseball handicapper to pick up. Some of our preseason hunches may have been confirmed or debunked and other wait-and-see situations may have started to unfold. But regardless, while you may think that what happens the first week of April won’t impact how you are betting in July I can say that I (slightly) beg to differ. Below is a run down on just some random thoughts, observations, and tidbits that I noticed in the American League over the opening week of the season. Check back tomorrow for my opening week thoughts on how teams in the Senior Circuit opened up. Without a doubt the Jays have been the biggest surprise in baseball. And in reality they should be undefeated right now with sweeps at Texas and at Baltimore. Their only loss was on opening day when they blew a lead in the bottom of the ninth. (Naturally, this was the only time I bet on them all week.) This Toronto team is not nearly as bad as people think and it could be a consistent moneymaker. They are likely only a 76-win team, but they get great prices. Even as well as they have played they were still underdogs on Monday – at home – to the scuffling White Sox. And their pitching isn’t nearly as bad as people think. It’s “good” in the way that Minnesota’s pitching is “good” – the starters throw strikes, are consistent from start to start, and the bullpen takes care of business. Yeah, they still destroy the ball. The champions opened in a pair of lions’ dens in Boston and Tampa Bay. How did they respond? They dominated and won both series. 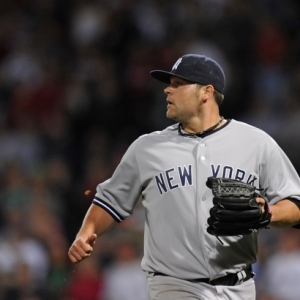 I love Joba Chamberlain at the back of the bullpen paired with Mo Rivera. This team is just awesome and is set for another great year. And the other thing: the slow April starts of the Joe Torre Era look like they may be a thing of the past. The Red Sox looked fine to me despite struggling a little bit more with Kansas City than they should have. But that first game loss was really just a hangover from dumping two of three to the Yankees. Lackey and Beckett look great and once Lester rounds into form they’re good to go. I loved the Adrian Beltre signing and he has gotten off to a nice start. He’s going to have a great year. Now they are just waiting on V-Mart. I have an ‘under’ bet on their season wins total at 89.5 and I’m going to win it. This isn’t a 90-win team. It just isn’t. They are going to be overpriced on the road and I am looking for this team to follow the exact same path as they did last year. People will call it underachieving. It’s not. This is a good team but not one that will raise a serious threat to the top two. Their role is that of spoiler. Anyone that thought that Mike Gonzalez was going to be a good closer for this team is an idiot. If you watched Gonzalez last year in Atlanta he was barely closing games and he was getting lit up by any decent hitters/teams that he faced. He could shut down the Pirates but a team like the Phillies would kill him. Gonzalez is garbage. And if not for him this team should be 3-3. What is stunning to me is the record against the total. With the bats they have in this lineup (and with their awful pitching) you would expect barnburners. Those days will come. But just surprised how much they have been shut down. And Brian Roberts is a mess right now. He should be on the D.L. All he is doing is pulling that offense down. Now that Miguel Cabrera isn’t playing drunk he is back to being the gorilla that the Tigers expected. Right now he and Magglio Ordonez are killing the ball. And with a little help from guys like Carlos Guillen and Brandon Inge (who is just a ball player) or the young kids like Austin Jackson this team is rolling. But be wary: they have played the Royals and the Indians so far. That’s not exactly a Murderer’s Row. But success breeds confidence and that breeds more success. We will see. But I’m not totally sold and this team could get overrated really quick. I absolutely love how this team has looked. They lost only once out in Los Angeles and then they manhandled the White Sox. Their only loss in that Chicago series was a White Sox comeback in a game where the Twins had almost no interest in playing. This team is going to kill the mediocre righties that teams like Kansas City and Detroit throw at them while also set to handle the mediocre lefties on teams like the Indians. This is by far the best team in the division. Now we need to see how the new ballpark works in. I hear it’s a hitter’s haven. But is this team going to lose one of the most significant home field advantages in baseball? Or will they catch a wave and ride it like the Mariners did around the time they opened Safeco? I absolutely love the DP combo of Orlando Hudson and J.J. Hardy. Talk about two brilliant pickups. Are the starters good enough? So far, so good. This team hasn’t hit the ball at all out of the gate. They look terrible at the plate. And it’s not as if they have been facing a bunch of aces. Houston has been garbage in the N.L., but they have faced a bunch of Cy Young candidates. The best guy the Sox have seen was probably Scott Baker. So a disappointing start here. The main issue is that this team doesn’t have enough/any good left-handed bats. I can see that being an issue all season. Paul Konerko looks good and Carlos Quentin looks good. But if they don’t get Alex Rios and Juan Pierre going this offense isn’t going anywhere. That’s a lot of pressure on two guys that we don’t know have much left to offer. But with Chicago’s pitching staff they won’t go away this year. I kind of like this team. I still can’t believe that they pissed away an 8-4 gimme win to close that Detroit series. With that they would be 3-3 and feeling pretty good about themselves. But their bullpen is going to be an issue all year so I would kind of get used to it. But I like all the lefties that this team has in the middle of the lineup. At least, I will like them once Shin-Soo Choo gets going. Travis Hafner is off to a respectable start. But where he heads (the D.L., the All-Star Game, somewhere in between) kind of holds the key to what we’ll see from this offense. Justin Masterson and David Huff both looked pretty good in their starts. It was encouraging. But we’ll see how they hold up over 30 starts. This team won’t be a 95-loss pushover. That’s as far as I’m willing to go. If you are an optimist you can say that Kansas City hung tough against two of the better teams in the A.L. (Tigers and Red Sox). If you are a realist you can say that the Royals have already been outscored 36-23 heading into Monday’s game and they were only competitive in the two games that they won. Oh, and both of those wins were come-from-behind, one-run victories. Their pitching is a mess behind Zach Grienke. And their hitters aren’t enough to back Grienke up when he does go. Scott Podsednik and Rick Ankiel were nice pickups and are paying immediate dividends. But those aren’t going to be guys that lead a 75-win team. I really like their pieces. But this team has zero top-end talent. They need two All Star-caliber players – like a Prince Fielder and a Matt Holliday – to be even considered in this division. They don’t have them. So mediocrity it is. I’m not all that surprised that the A’s came out and got off to the best start in this division. They are the healthiest team and they looked – by far – as the more inspired, more focused, and just more intense team in their first two series. And the good news is that they were series against division rivals. This team is just a moneymaker to bet on or bet against. They aren’t going to get swept very often because they play such fundamental baseball. But they aren’t going to sweep many teams because they don’t have much hitting talent. So chase away on this team – for or against – and you should bank. Also, I’m big on fading Ben Sheets, but I am intrigued by the value of the arms in the middle of their rotation (Braden, Duchscherer, Anderson). This team is going to be feisty all season. I feel like it’s been a hectic first week for the Rangers. Ian Kinsler is hurt. Nelson Cruz is impossible to get out. Michael Young has been a mess. Vlad Guerrero is hitting like he’s 25. Frank Francisco has blown three saves and has a 27.00 ERA. Their five starters have a combined 1.65 ERA. They should have swept Seattle. They should have been swept by Toronto. Bottom line: once this team gets on the same page they are going to be very good. But right now they are all over the place and are a team I wouldn’t touch. It looks as if last year’s ‘under’ run is going to carry over, as this team’s pitching remains underrated. Well, to say that the Halos are off to a slow start is an understatement. And the only reason they are 3-3 against the total is because they have given up a ton of runs. They have surrendered nine or more runs in three of their last four games. Ouch. So far one of the main issues I see with this team is that they have gone from a team that just killed left-handers to a team whose best power hitters are now left-handed. And its time to give up on Brandon Wood. The guy is just not a Major Leaguer and he is just a drain at one of the premium offensive positions. It’s way too early to give up on this team. They will be fine. But with 17 of 23 games coming up against the Yankees, Red Sox or Tigers things could get worse before they get better. Their slow start is a surprise to everyone except me. This was my 5.5-Unit top futures play: Take ‘Under’ 85.5 wins for Seattle. This team entered the season completely overrated. They don’t have enough pop to score consistently and they have way too many strikeouts in that lineup. You could deal with the K’s if they had some 30-homer guys in the middle of the order. They don’t. But they are still No. 3 in the league in strikeouts. And that pitching staff is just awful. I mean, Ryan Rowland-Smith? Doug Fister? Ian Snell? I hate to tell you, but even when Cliff Lee comes back those three are still in the rotation. This team is a dud. Ferringo has cemented himself as one of the great minds in MLB handicapping. For more information on his Member’s Picks, check out his Insider’s Page here.